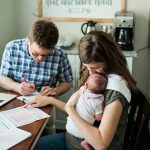 I can't believe we bought our house over five months ago and it has taken me this long to share a house update on the blog. There are still so many things I want to purchase for the house and I keep telling myself that I'll write an update just as soon as we make the next tiny improvement. But then there's another small improvement on the horizon and I delay the update until new feature is complete. And since we are watching our budget and only improving one small item at a time, the update keeps getting pushed off. Until now. 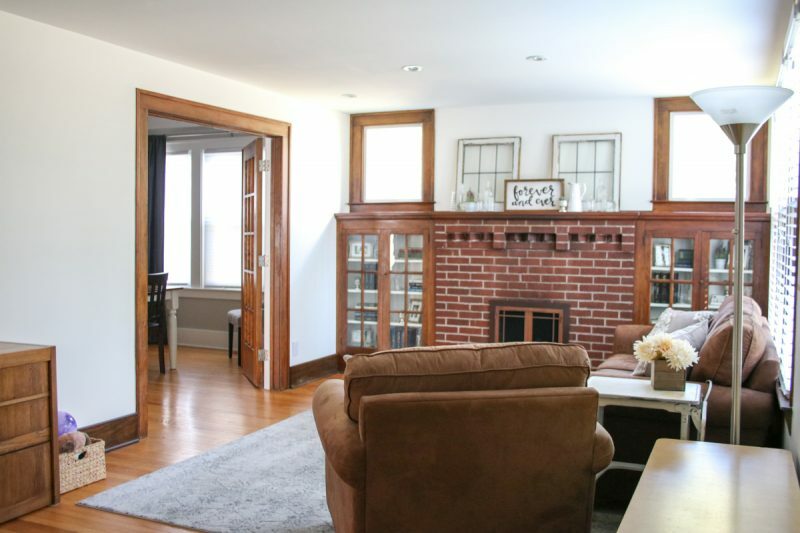 Even though everything in our house still feels very much like a work in progress, I've decided to bite the bullet and finally share an update of our home in its current state – which will feel outdated to me in about a week. But so it goes. 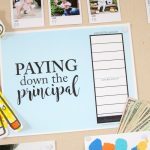 As I was planning this post, I had every intention of sharing a complete tour of our home and giving you the full update all at once. But I found myself with over 60 images that were ready to share and a million words to say. 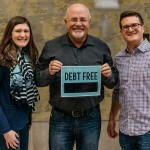 It seemed as though it might be a more enjoyable (and less daunting) experience for you if I broke the tour down into four separate blog posts. 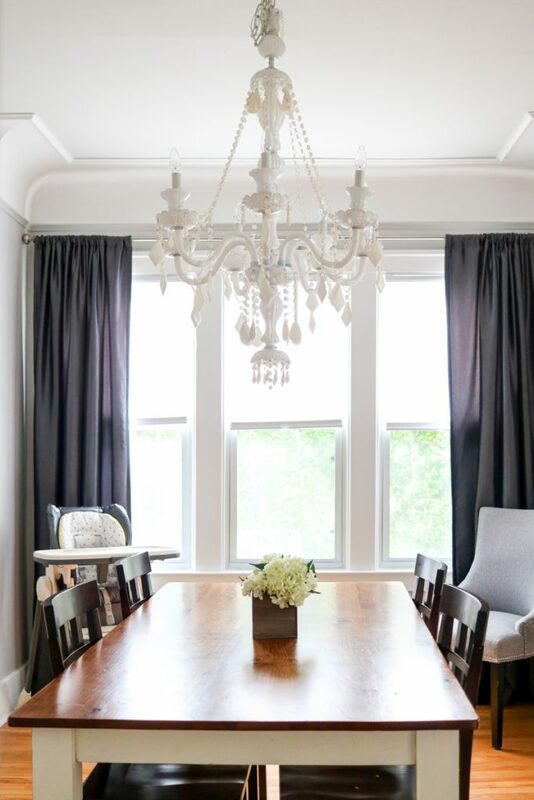 Today I am thrilled to share an updated tour of our living and dining rooms with you. We still have a long way to go before both rooms are complete, but I am so pleased with how far we have come and I sincerely think you will love this tour as much as I enjoy sharing it with you. Come on in! This post contains affiliate links. We earn a small commission each time someone make a purchase through one of our links, which helps to support the blog and our family. Without a doubt, the living room required the most time, energy and careful thought to create a beautiful and functional space. 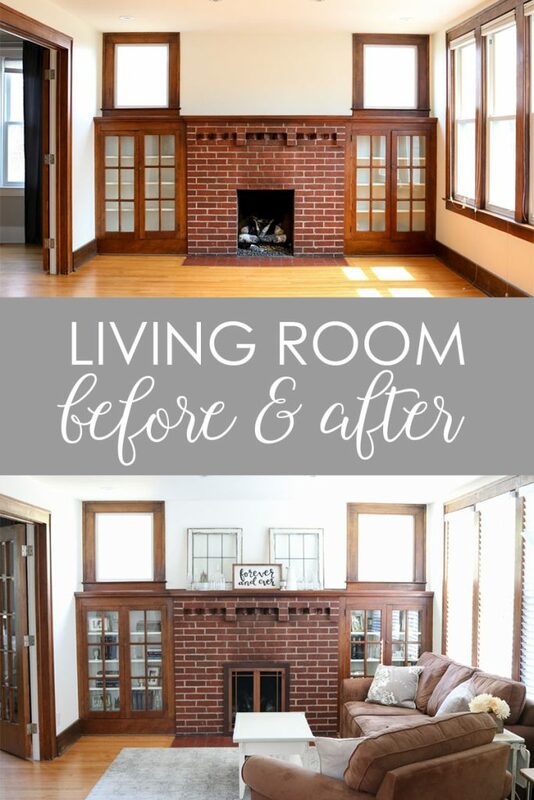 I would love to live in a house with pale walls and all-white trim, but there was so much character and natural beauty in the original wood and fireplace for this room, it just felt wrong to paint over them. 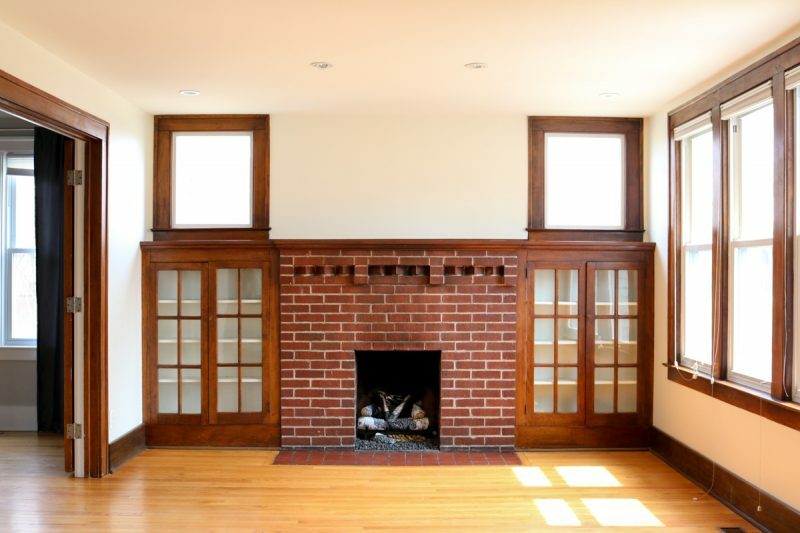 Rob loved everything about the built in cabinets, fireplace, and dark wood trim from the moment he saw them. It just took me a little while to reimagine the space to fit my style. It didn't help that when we first got the keys to the house, the living room felt so yellow to me. Even the ceiling looked yellow. There are a lot of warm tone woods in the room and I genuinely couldn't tell if the walls were yellowish or if the wood floors just naturally threw a yellow tone onto the walls and ceiling. 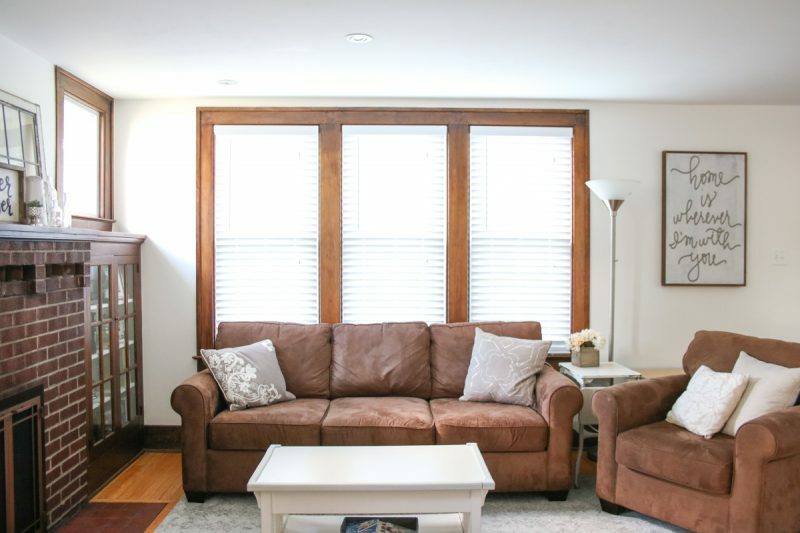 The previous home owners had also installed cellular blinds in a light tan color, which just accentuated all the brown and yellow tones in the room when they were drawn closed. I hated when the cellular blinds were down during the day because they made the room feel so dark (especially with the tan tone of the blinds). Raising the blinds caused another set of issues. When they were open, the windows felt so incredibly bare. 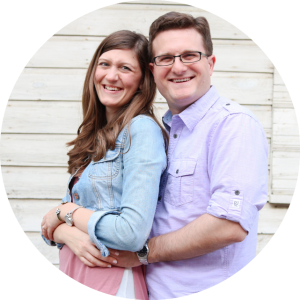 Our house is situated on a busy corner of the neighborhood and it felt like we didn't have any privacy while the blinds were up – like everything in the house was wide open for the whole world to peer in and see. I was also very concerned about the strings. When the blinds were up, the strings dangled onto the floor, which was a huge safety issue for Dessa. 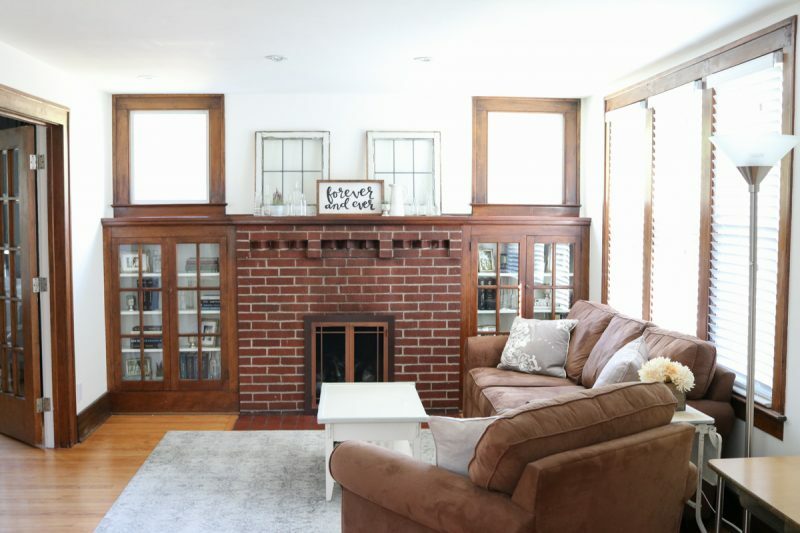 The fireplace and built-in cabinets were original to the house and a gorgeous focal point – they just weren't entirely functional. One of the doors on the left cabinet didn't quite close all the way and the gas fire place was missing a door – which was yet another safety concern with a toddler in the house. There are still so many things we want to accomplish in this space, but I'm proud of the progress we have made so far in the living room. 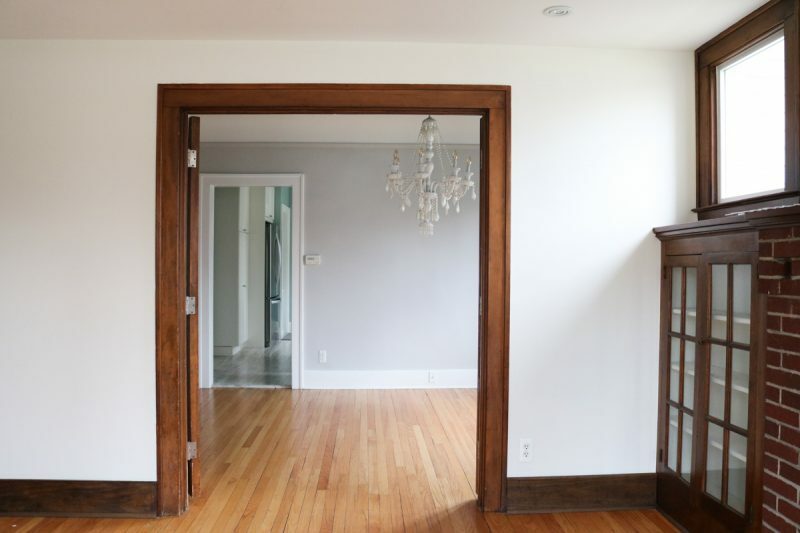 The first task at hand was to give the room a fresh coat of white paint to brighten the space. 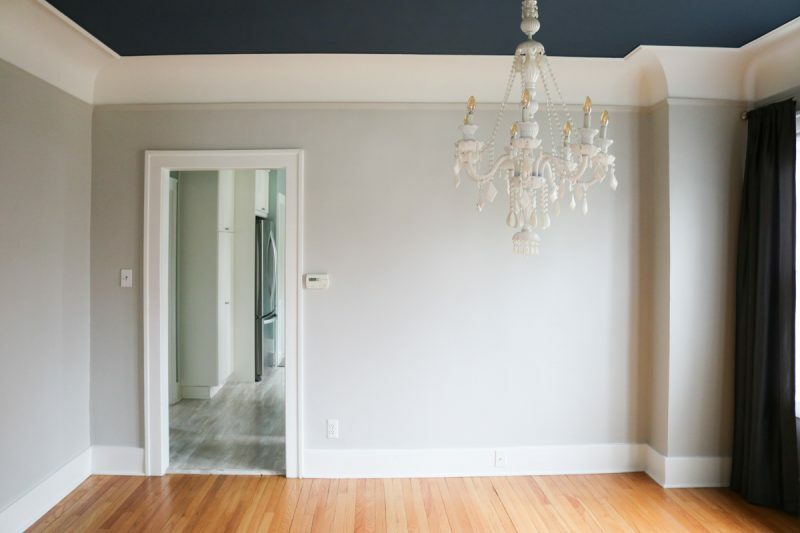 We went with Simply White from Benjamin Moore and it was easily the most dramatic change we made to the room. I'm so glad I trusted my gut and decided to repaint the existing white-ish walls. And as it turns out, the ceiling wasn't yellow at all. It was just reflecting the yellow tones from the floor and walls. We made the right choice when we decided to just leave the ceiling alone and see what happened after the walls were repainted! We also decided to remove all of the cellular blinds in the living room and replace them with basic white faux-wood blinds. 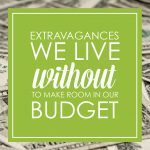 It was another simple, relatively inexpensive improvement that made a huge difference in the room. The new blinds solved so many problems at once. We could leave them lowered all day and simply twist the blinds open to let in light. 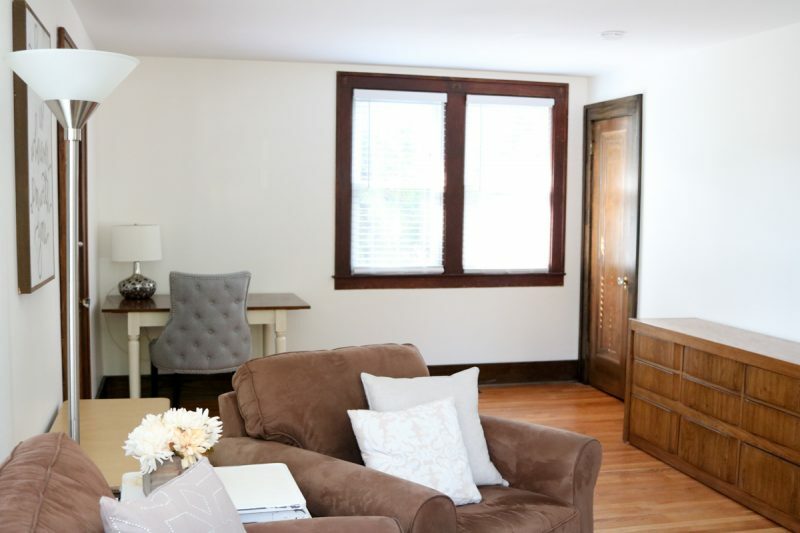 Even though it may seem like a small thing, just having the rows of slats in the window makes enough of a statement that it doesn't feel like we neglected the windows completely. It also feels more private than when the cellular blinds were raised to leave the windows completely bare. The fireplace and built-in cabinets are now completely functional and safe for Dessa. One of the largest single-item purchases we have made for the house since we moved in was a custom fireplace door. The door was expensive and we hit a few speed bumps along the way, which made the process seem to take forever. There were a shocking amount of decisions to make for the door and I worried about the style and color choices we made while we waited for it to be manufactured. Once it was finally installed, I took a deep breath of relief – our new fireplace door was a perfect fit for the style and personality of the fireplace and cabinets surrounding it. If you're curious, it's a Carolina door which we ordered through a local fireplace store. We also hired a handyman to tinker with the built-in cabinet doors. They now close and latch properly and are simply styled with books, framed photos, and a few decorative items. 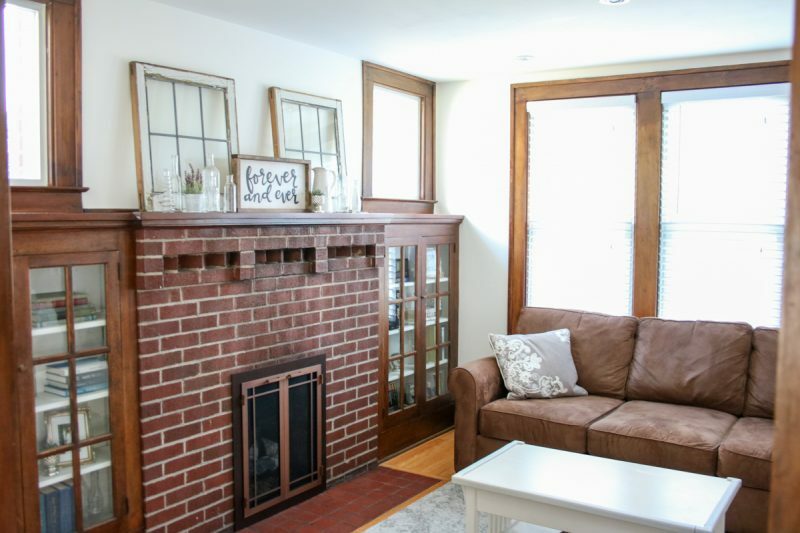 One day I want to purchase a set of custom leaded glass inserts (similar to this) for the two square windows that are on each side of the mantle. I think it would add a layer of sophistication to the room. When Rob and I worked on our initial move-in budget for home improvements and furnishings, we had big plans for this room. 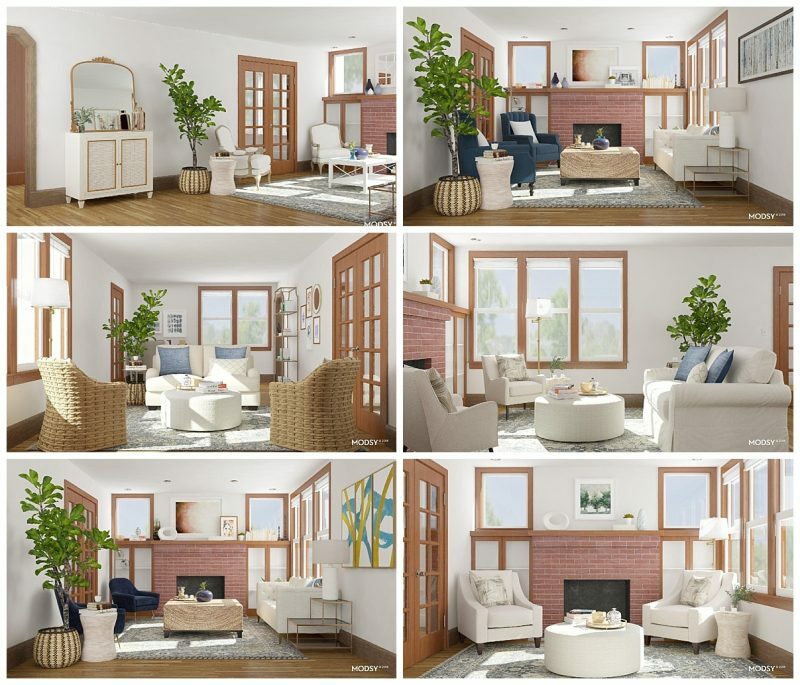 The living room is the largest space in the the house and we wanted to invest in new furniture right away so we could enjoy the room to its full potential. We even started a design project on Modsy. It was fun experimenting with the custom 3D layouts that the Modsy designers created for our space as we started to plan the perfect layout and furnishings for the room. Here are a few of the design layouts that a designer at Modsy created for us. 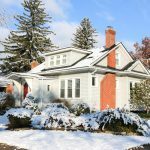 You may recall that our home improvement renovations were more extensive (and more expensive) than we initially anticipated, but we chose to barrel through them all at once while we had handymen and contractors working in the house. In the process we blew right threw the home improvement budget and dipped considerably into the home furnishing budget – which unfortunately meant that our plans to purchase new living room furniture were put on hold indefinitely. 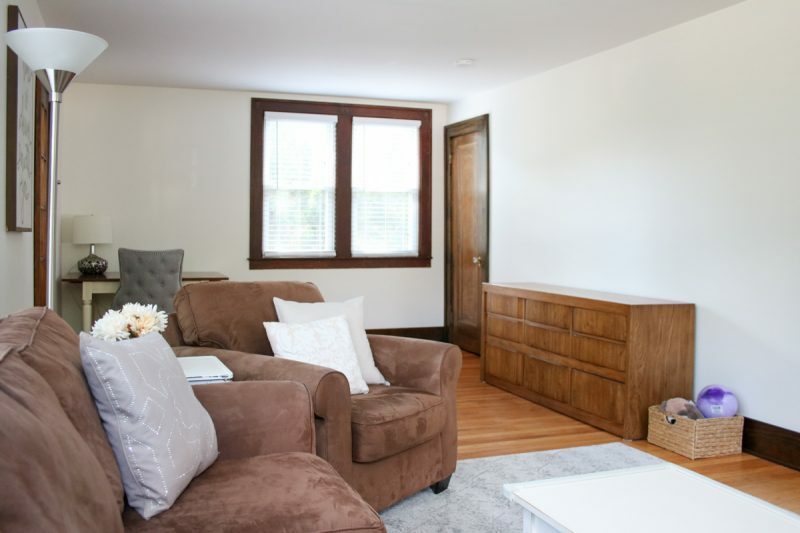 Thankfully, our existing living room furniture fit well in the space and coordinated with the brown wood tones of the room. While we wait to rebuild our savings, it gives us more time to experiment with possible design layouts. Thankfully, Modsy offers unlimited design revisions so I can keep making adjustments to the room layout as we settle more into the space and ideas continue to change in my head. 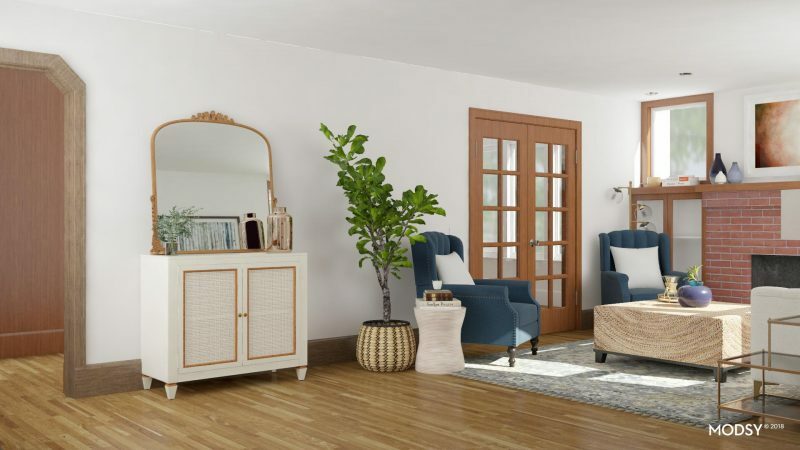 If we nail down the perfect furniture and decor items through Modsy (which is very possible because they source their furnishings from popular online shops like Wayfair, Pottery Barn, West Elm and Anthropologie), we can purchase everything directly through the Modsy and save 10% with the Modsy Insider Rewards program. 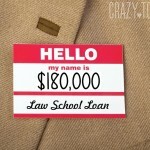 Modsy also honors the sale prices of any purchases made through the site. And if I happen to find the perfect furniture at an antique shop or local retailer, that is just fine too. At this point, I consider the money well-spent even if we don't purchase a single piece of furniture through Modsy. I'm still dreaming of the day when we have enough money saved to purchase a few new pieces of furniture, but the space is comfortable and functional enough for now and Modsy has already been helpful to us – we set the room up in this configuration after seeing a similar layout from our Modsy designer. One of the areas that we sacrificed when we purchased this house was a separate home office. We don't require a lot of space to work on the blogs or other tasks at home, but we did need a small dedicated work area of some kind. The back portion of the living room is a perfect out-of-the-way nook for each of us to work when we need to hunker down and get something accomplished. Just like the area we use to relax, this portion of the room had the same yellowish paint and tan cellular blinds with super-long strings installed in the windows. The back corner of the room also had a funny little wood paneled tunnel that went under a stairway and led into one of the bedrooms. Our first order of business in this area of the room was to say goodbye to the dark, cave-like tunnel and transform that corner into a more functional space. We hired contractors to convert the passage into a small closet – which became the perfect place to store our file cabinets, printer and other home-office essentials. 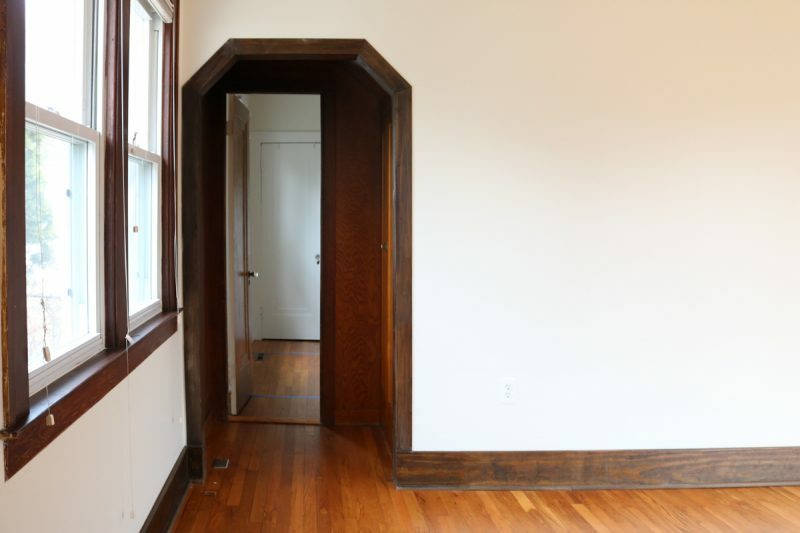 They also drywalled the unnecessary doorway into the adjacent bedroom and the accompanying door was moved into the living room as a closet door. 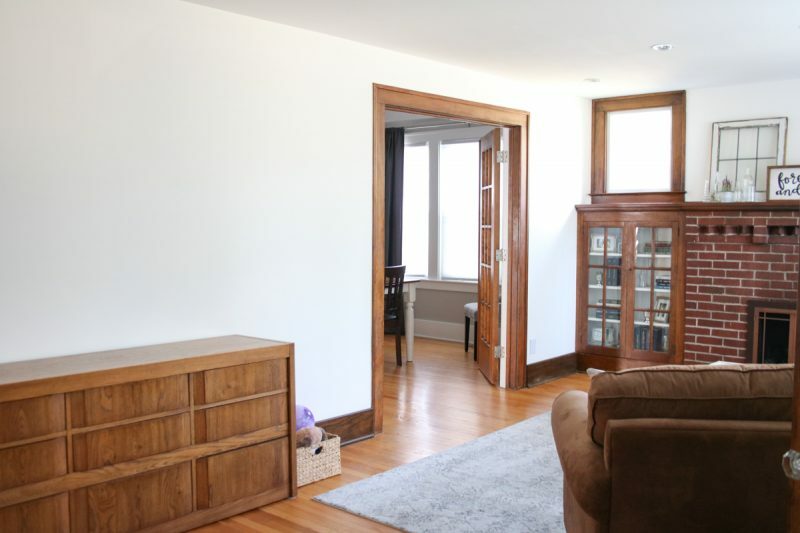 All of the doors on the first floor are original to the house and we were so thankful to restore and repurpose the bedroom door in a functional way that helped to maintain the character of our living room. The rest of our home office area still needs a considerable update. Rob and I jokingly refer to this nook as the armpit of the house. It's sparsely furnished and feels so incredibly empty. We are just sort of making do with the pieces we have available right now. All of our office supplies are stored in an old dresser of Rob's that I have been eager to replace ever since we joined households after the wedding. It was best-used in our bedroom at the rental house because people only saw the side of it when the looked into the bedroom from the doorway. But now the dresser is back on display prominently situated in the back of our living room. There's also a small table from my childhood tucked under the “Home is Wherever I'm With You” sign. We currently store a basket with blankets under that little table along with my camera bag and the messenger bag Rob takes to work each day. 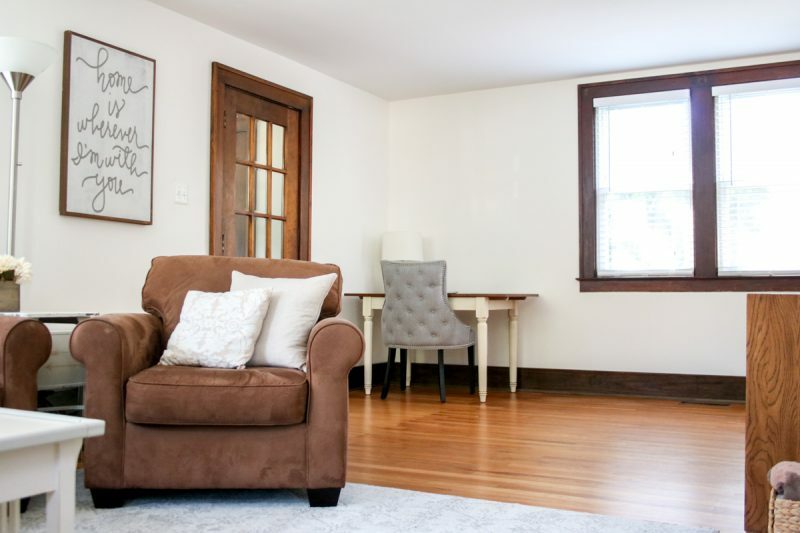 We are planning to continue using the little table as a desk – the chair might get to stay in the room too, but I really want to find an antique dresser to place under the sign and trade the floor lamp for a table top lamp that I can place on the new dresser. As for the other wall, I'm still trying to nail down a perfect setup. A few of our Modsy designs featured a cabinet, tall fiddle leaf fig, side table and a pair armchairs placed along the wall and that layout has been appealing to me. Another design moved our work desk over to where the dresser is and placed an upholstered bench in the back corner of the room. The wheels in my head keep spinning as I try to figure out the most functional (and attractive) layout for our needs. One thing I know for certain, we definitely plan to purchase a second rug for the office area to help fill the second half of the room and give it a little extra life. 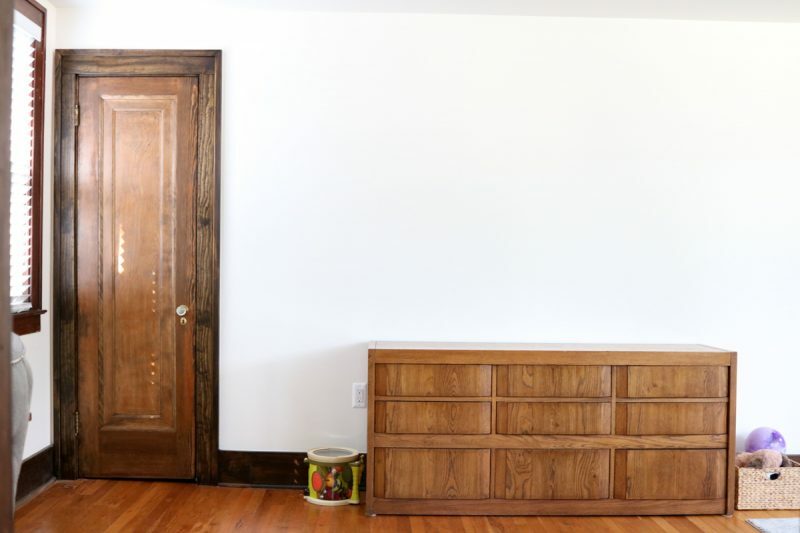 Here are a few furniture and decor pieces I found online that get me excited for the space's true potential. In the meantime, we will keep looking at this sad wall and dreaming of how beautiful this room will be one day. At least we've made some progress! 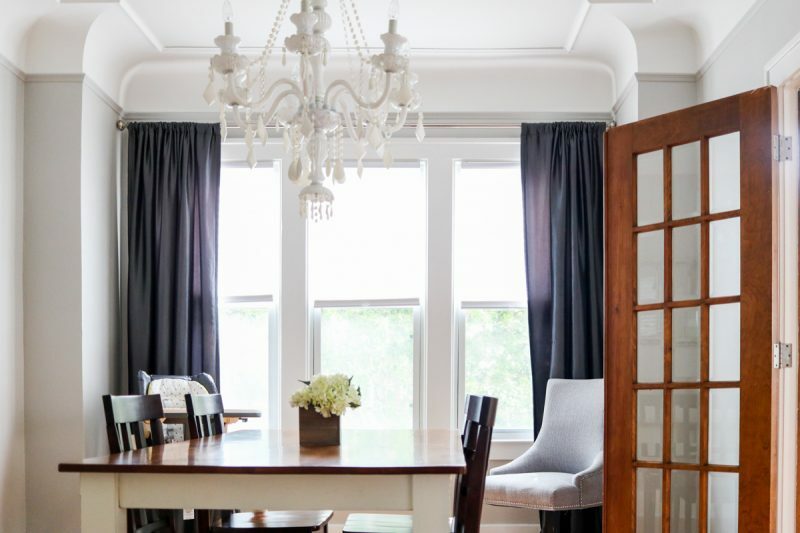 The dining room is situated off the living room, through the double doors that Dessa loves to play with. What the room lacks in space, it makes up for in character. 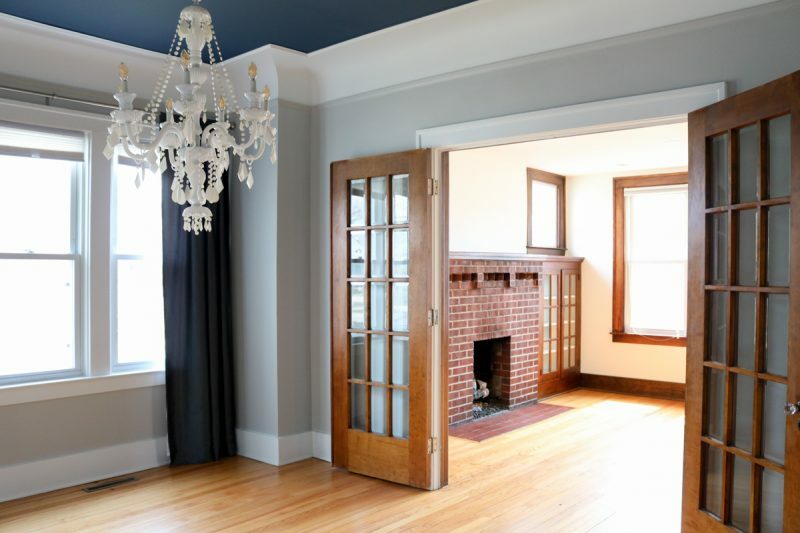 I especially love the plaster molding around the ceiling. 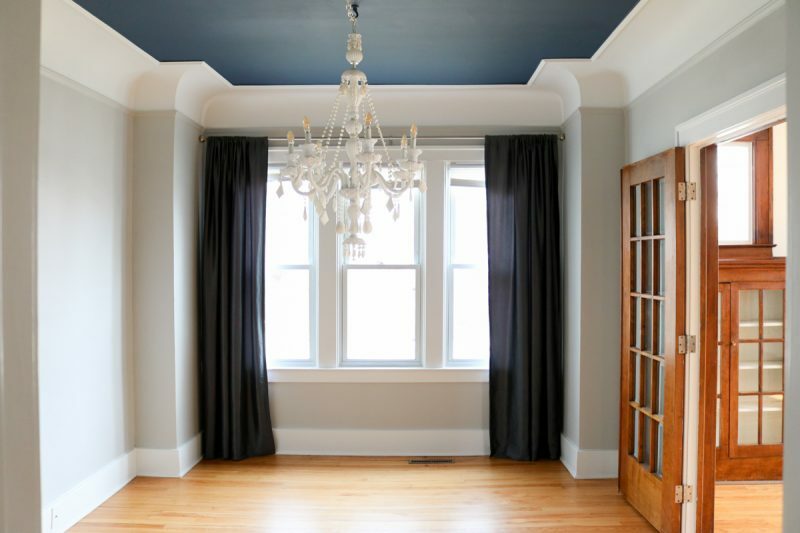 Although the navy blue accent color on the ceiling was gorgeous, the room felt a little too regal for our lifestyle. Here's how the dining room looked before we moved in. 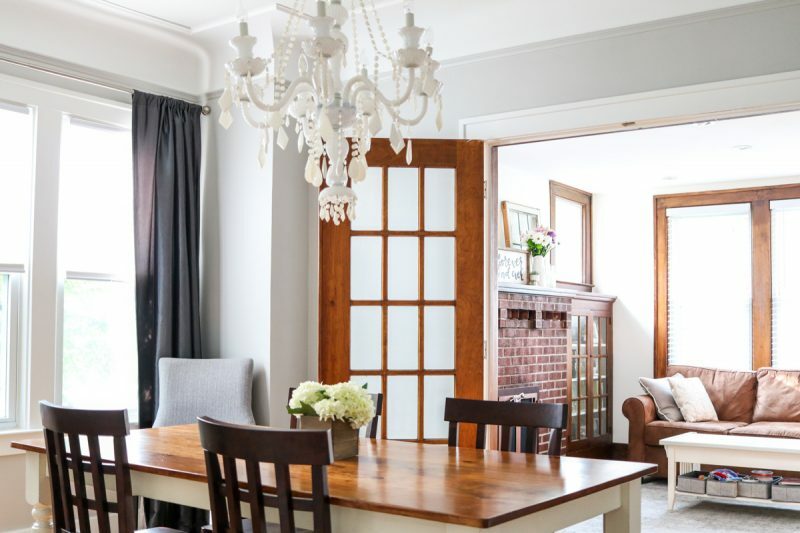 While it is challenging to fill the space in the living room in a special way, our cozy dining room has been relatively easy to breathe a little life into. 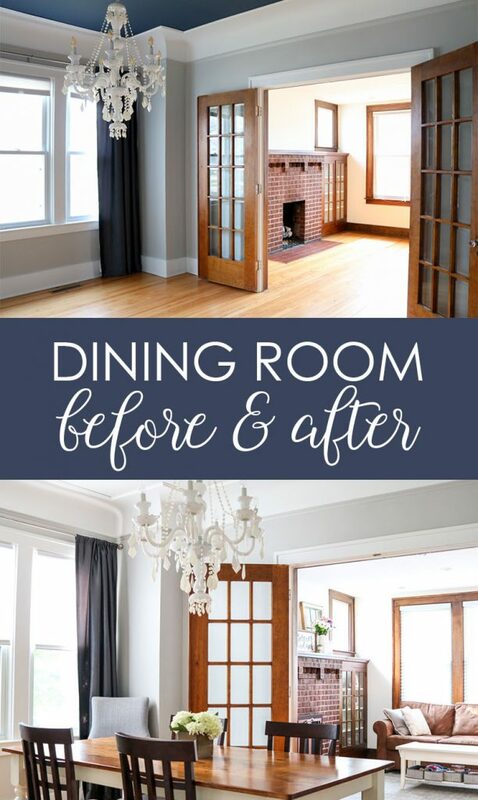 It took took two coats of primer and another two coats of paint to transform the dining room ceiling, but it is a change I am so happy we made. 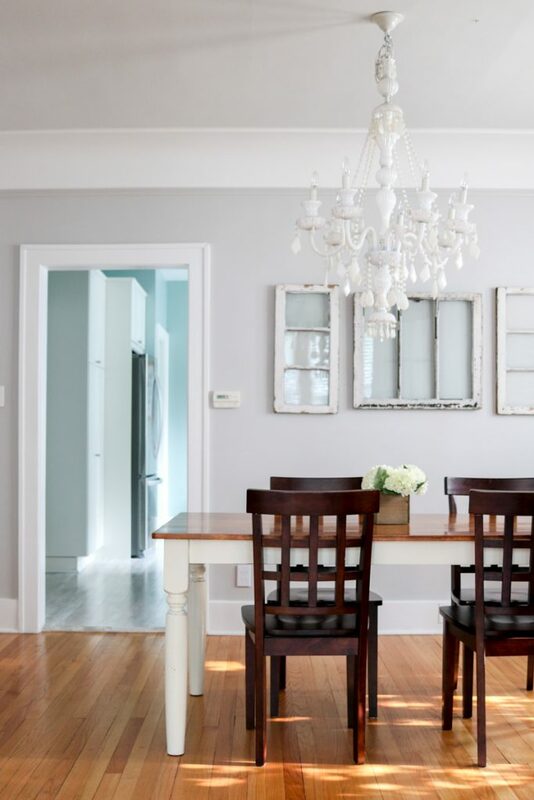 We painted the ceiling Paper White by Benjamin Moore, which is a lighter shade of gray than the Coventry Gray that is on the walls, but it coordinates beautifully and subtly draws the eye up to admire the plaster work around the edges of the ceiling. When we first moved into the house, I wasn't sure how I felt about the chandelier in the dining room. I kind of liked the light fixture, but I didn't absolutely love it. Rather than invest in a new chandelier right away, we decided to keep the chandelier up for now and see how we felt about it down the road. After a few months, the fixture definitely started to grow on me, but there was one detail I needed to change – the lightbulbs. The previous homeowners had used some type of LED light bulb with a yellow stripe in the filament. I may have had mixed feelings about the chandelier, but I knew for certain that I absolutely hated those light bulbs. We switched to incandescent bulbs and the chandelier immediately looked so much brighter and more stunning. 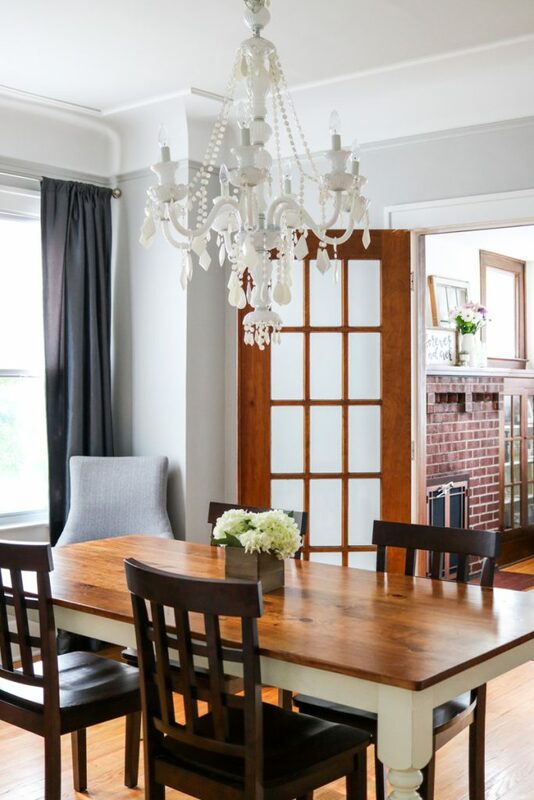 We also un-swagged the chain of the chandelier so that the light fixture would be positioned in the center of the dining room, rather than off to the side as it was when we moved in. Soooooo much better! All that was left was furniture for the room. 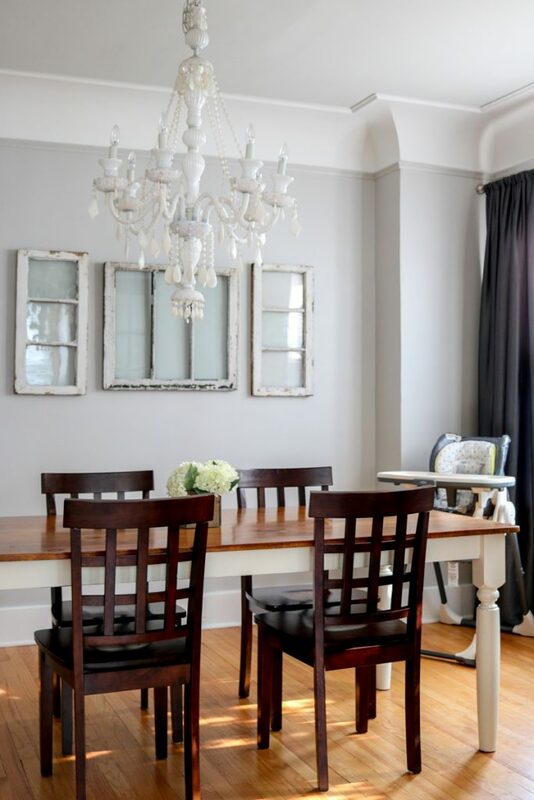 I'm so pleased with how well our existing dining table, chairs, and accessories fit the character of the dining room. Our table was custom-made from an area antique shop called The Lamb's Tail. It's the best little store for discovering old treasures that I have ever visited. The owners don't create custom tables anymore, but they still find and sell unique vintage furniture and decor. The old weathered windows on our wall are also from the Lamb's Tail. The wooden dining chairs are actually from a cheap assemble-it-yourself dining set that I purchased when I first moved out of my parents house. They're ten years old and have proven to be quite sturdy. I love the contrast that they bring into the room and how they marry the light airiness of the dining area with the darker wood tones of the living room. The next major project for this room will be to fix the squeaky floors. 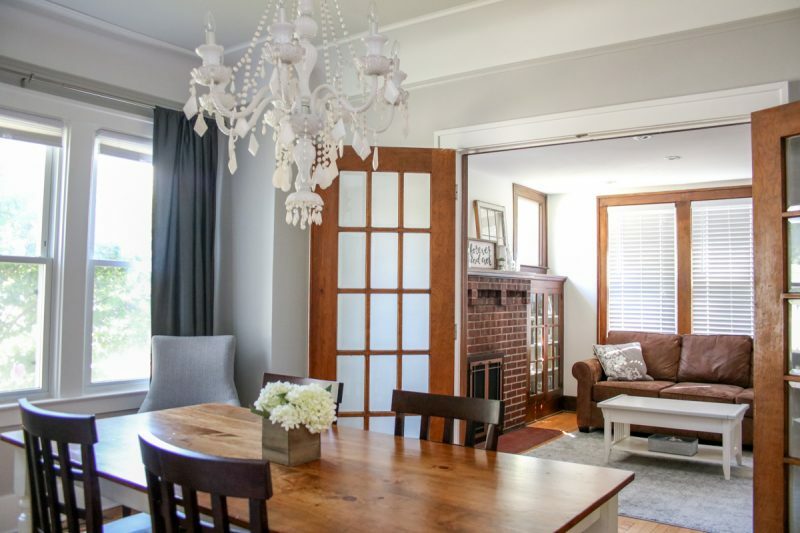 Nearly every room in the house has squeaky floors, but the dining floors have proven to be more troublesome than all the others because Dessa's nursery is right next to the dining room. We do our best to tiptoe through the room, but the squeaky floors have woken her from sleep one too many times. Repairing the floors recently jumped to the top of our home to-do list. 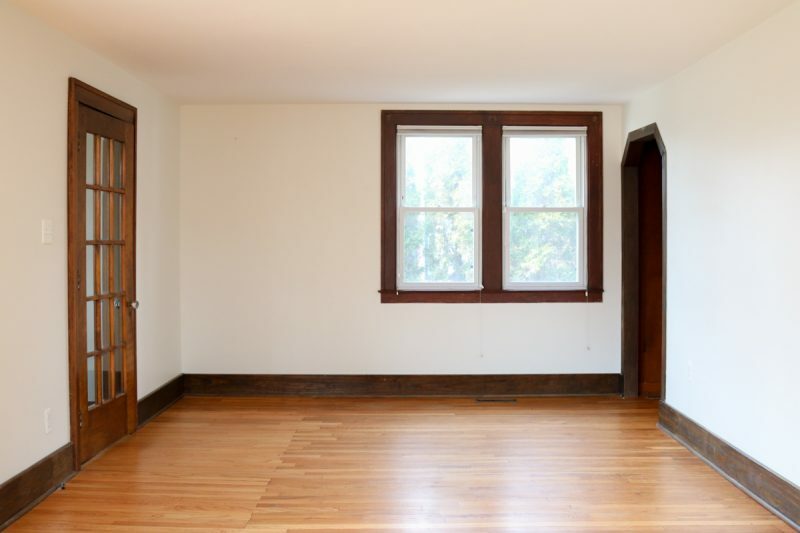 After that, I would love to purchase a buffet to place below the antique windows and a rug for the floor to warm up the space and help muffle some of the sound that always seems to bounce throughout the lower level. Slowly, but surely the house is coming together. It feels more and more like the home we've been dreaming of every day and I am so excited to continue the tour further down the hall next week when I share a kitchen and bathroom update on the blog. In the meantime, I would love to hear what you think about our current progress in the comments. I love all the changes you’ve made. You made excellent decisions in keeping the character of your 1925 home. My favorite change is the fireplace door. It is amazing! Everything you’ve done is beautiful! Thank you so much, Cynthia! I can’t tell you how much I worried about our door selection and it was a massive relief to see how well it fit with the room’s other details.